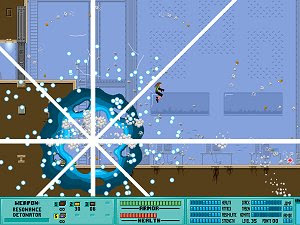 Iji is an action-packed strategic platform shooter with a detailed story, large levels with multiple paths, powerful bosses and lots of secrets. There are alternate gameplay events, dialogues and scenes depending on what you do, a wealth of extras and bonus features, and seven stats to upgrade through a leveling system. Iji herself has superhuman strength and abilities, and can crack Nanotechnology, use her enemies' most devastating weapons against them, and be a pacifist or a killer - the story adapts to how you play. Soundtrack by Chris Geehan and Dan Byrne McCullhough, songs also by Tom Mauritzon and Captain Goodnight (and LifeForce, but their song was not originally recorded for Iji).